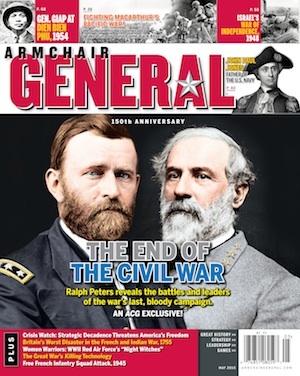 Tactics 101 101 – The Mechanized Infantry Platoon | Armchair General Magazine - We Put YOU in Command! In our last article, we celebrated our 100th installment. Again, thanks to all who have made this series possible! When we started, we never thought we would move into triple digits in terms of individual articles. As they say, anything is possible! Our hope is that the series has informed and entertained. Beginning this month, we will make a shift from light infantry to mechanized infantry operations. There are many differences, but lots in common as well. A good commander will be able to take advantage of the capabilities that mechanized infantry offers. This includes the strengths of both the mounted and dismounted elements of mechanized infantry. In our initial article, we will address the organization of the mechanized infantry platoon. Just as we did in our dissection of the light infantry platoon and company, we will get into significant detail. Within our discussion of mechanized infantry, we will use the US Army and the Bradley Fighting Vehicle — BFV (M2) as our model. We will start with the Mechanized Infantry Platoon. Much to discuss, so LET’S MOUNT UP! Throughout history, we have sought ways to maneuver our Infantrymen quicker and safer. In earlier times, it was generally tied to some sort of animal who could carry the Infantryman or if water was available we could utilize rafts or ships. As technology progressed so did our options for maneuvering our Infantrymen. At the end of World War I, as both sides began moving out of the trenches, options were needed to maneuver the Infantry. With the inception of the tank, something was needed to keep the Infantry in pace with advancing tanks and not be totally exhausted once they reached an objective. The obvious course of action was to put the mechanized in mechanized infantry. In the beginning it was basically having Infantrymen find somewhere to hang onto on a moving a tank. Not a good thing for the Infantrymen. It was a very uncomfortable ride and extremely dangerous. Since tanks were obvious artillery magnets; it made riding on tops of the tanks not a pleasant experience. With that said; it was a start. During the 1920s, there was much thinking going on the subject of warfighting. With men such as Fuller, Hart, Guderian, Chafee speaking; many started listening. They understood that for a force to fight in a combined arms style and be effective; the concept of Mechanized Infantry must be embraced. Their thoughts paved the way for the development of vehicles which could maneuver Infantry. With the onset of World War II, we began to see mechanized infantry move from theory to application. During the course of the war, we saw various vehicles utilized to maneuver Infantrymen. These included among many the German SdKfz 251 half-track APC, the American M2 and M3 halftracks, and the British Bren Carriers. There was now no question that Mechanized Infantry were a staple in most nations’ armies. After World War II, the evolution of vehicles designed to maneuver the Infantryman clearly took off. Like any area tied to warfighting; it was a heavily contested competition between the USA and the USSR. For the US Army it was a progression from the M75 to the M59 to the workhorse — the M113. It was during the Vietnam War, where the US began to experiment with variants of the M113. With the addition of some different weapon system platforms; the US was beginning to move from an Infantry carrier to an Infantry Fighting Vehicle. On the other side, the Soviet Union was progressing even faster than their ideological foe. During the World War, the USSR was one of the least advanced countries in regards to maneuvering their Infantrymen. They basically relied on trucks and riding atop tanks. Following the War, they were extremely busy in their design and implementation. It’s beyond the scope of this article to get into all the vehicles developed by the Soviets, but we will highlight some of the more significant ones below. In 1950, the BTR (Bronetransporter or Armored Transporter) 152 was produced. It was a wheeled transporter, but because of added armor protection it was very heavy and not extremely mobile. With machine guns attached, it had some punch, but was not real threatening on the battlefield. All that said, it was a marked improvement to what they had. In the 1960s, this wheeled transporter was replaced by the BTR 60. It was a significantly better vehicle in all regards to its “father”. The mid 1960s saw an incredible transformation in the ability of the Soviets to maneuver their Infantry. With the production of the BMP- 1 (Boyevaya Mashina Pekhoty), the Soviets moved from utilizing an Infantry carrier to using an Infantry Fighting Vehicle. With the advent of the BMP-1, the Russians could use the vehicle to support the maneuver of the Infantry. This was because the vehicle was tracked and fairly mobile and was equipped with a main gun (originally 73mm), an anti-tank weapon system and machine guns. The complexion of the battlefield had truly changed. This complexion was exhibited during the 1973 Yom Kippur War when Egyptian and Syrian forces were both equipped with BMPs courtesy of the USSR. For the next several decades, the Soviets made improvements to the BMP and these resulted in the BMP-2 and BMP-3. The changes focused on all aspects of the BMP. These included engine advancements, significant upgrades in all weapon systems, and far more armor protection. The end result was a formidable and highly productive Infantry Fighting Vehicle. The lessons learned of the 1973 Yom Kippur weighed heavily on all aspects of warfighting within the US Army. Even before the War, the Army was working on replacements for the M60 Tank and M113 APC. The War simply sped up the process. The fruits of their labor were the M1 Abrams tank and M2 Bradley Infantry Fighting Vehicle. Each saw its introduction into the field in the early 1980s. For the Bradley, its moment of truth was Operation Desert Storm in 1991 and it did not disappoint. As with the BMP, the Bradley has gone through many transformations. These include the M2A1, M2A2, M2A2 ODS (Operation Desert Storm), and the M2A3. The interworking of the Bradley was also utilized as the body for many other vehicles utilized by other branches (Air Defense, Engineer, etc…). It has been a stalwart of the force and combined with the M1 Tank they are a devastating pair. The pair clearly influenced the development of other tanks and Infantry Fighting Vehicles within other countries. We will address the particulars of the M2 momentarily. As noted above, for brevity sake we will not go in to detail on the Infantry Fighting Vehicles of today. These vehicles have the same purpose as the original BMP or Bradley – to assist in the maneuver of Infantryman getting them to the right location at the right time. Since the prototype for our discussion on Mechanized Infantry is a unit equipped with the Bradley; let’s highlight the Bradley below utilizing the categories of survivability, mobility, reliability, and lethality. The M2 Bradley Fighting Vehicle – Desert Storm highlighted the survivability, mobility, reliability, and lethality of the Bradley. Let’s address each below. Survivability – The Bradley will not protect you from every weapon out there, but an Infantryman feels pretty safe inside the vehicle. It has standard armor and can be fitted with more protection if needed and other types of armor. Another asset the Bradley can call upon for protection is smoke. The Bradley has two ways to produce smoke. First, it is equipped with a couple of M257 smoke grenade dischargers that are each loaded with four smoke grenades. Second, the Bradley has the ability to generate smoke via its engine which has a smoke-generating system. Mobility – Having been on a Bradley in all types of terrain; we can verify the ability of the Bradley to operate in a wide variety of environments. Its versatility comes from a powerful engine and wide tracks which truly grip the ground. This enables it to keep up with the M1 tank! It can climb hills, motor on rough surfaces and even swim if required (not optimal, but feasible as we can verify!). Reliability – Maintenance wise the Bradley is very reliable. In terms of keeping it running; it is hard to bring it down. As with all technological savvy combat vehicles; there can always be some issues with the electronics and the weapon systems. As you can expect, quality mechanics and technicians diagnose problems quickly and fix the issue. Roughly tied to reliability is the fact that the Bradley can be deployed to any environment via rail, truck, ship and aircraft. Lethality – The Bradley has a group of weapon systems which give it much versatility. It is highly effective against thin-skinned vehicles, other types of fighting vehicles, suppressing enemy Soldiers, and can destroy or disable enemy tanks. Let’s detail its weapon systems below. The M242 25mm Bushmaster Chain Gun – The Bushmaster is the perfect weapon to support the maneuver of the Infantryman. There are numerous reasons for this. First, the chain gun can fire a wide variety of ammunition. If an enemy bunker needs to be destroyed, high explosive (HE) ammo is the call. If thin-skinned vehicles must be destroyed, then HE again would be highly effective. Depending on the type of tank; armor piercing (AP) rounds are available to disable tanks or even destroy it. The beauty of the Bushmaster is that you can change the type of ammunition with the simple flick of a switch. Second, depending on the ammunition the Bushmaster can push out rounds to around 2000 meters. That is a significant overwatch capability when the Infantryman is on the ground. Third, and related to above is the fact is that it can pump out rounds at a very healthy pace. It can fire single or multiple shot and has a standard rate of fire of 200 rounds per minute. Thus, the Bushmaster’s ability to serve as both an assault and overwatch weapon make it the perfect Infantry Fighting Vehicle weapon. The M240C Machine Gun – Inside the Bradley, to the right of the Bushmaster is the M240C 7.62 mm coaxial machine gun. It is obviously an excellent suppression weapon and is generally utilized against the enemy’s infantry. On a good day, a round could travel up to 3,700 meters. For planning, it is best to figure up to 800 meters for a point target and 1,800 for an area target. TOW Anti-Tank Missile – When the enemy possesses formidable tanks or armored vehicles which can impact mission accomplishment; the TOW can be the weapon of choice. Each Bradley is equipped with a twin tube launcher. The missiles themselves are already loaded into the launchers and are ready to be fired. The system is highly accurate and the missiles range is almost 4 kilometers. The Bradley itself must be stationary in order to fire the TOW. Firing Port Weapons – On the sides of the Bradley are firing ports in which the M231 Firing Port Weapon can be shot by the Infantrymen riding on the back. It is essentially an adaption of the M16. To be honest, these weapons are seldom fired and if they are you are probably in a little more trouble than you want to be. With a brief history of mechanized infantry and a discussion of the Bradley complete; we can move on to addressing the Mechanized Infantry Platoon (Bradley Equipped). Capabilities – The combination of a platoon full of highly skilled Infantryman and four BFVs can be lethal if utilized properly. Let’s highlight some of these key capabilities below. The combination of dismounted infantry and the weapon systems existing on the Bradley enable the platoon to be an excellent force to assault enemy positions (size dependent of course). The combination is superb in an urban environment. Can be utilized to deny enemy infantry the ability to achieve their purpose and task. Block dismounted avenues of approach. Depending on the size of the enemy can block mounted avenues of approach. Seize key or decisive terrain which will facilitate success for the company or battalion. Can conduct various types of mounted or dismounted patrols in support of stability operations. Operate superbly during the night and limited visibility conditions. Can be utilized to conduct various security and recon operations if required. In a defense, can be used to occupy a strongpoint if a piece of terrain is critical to overall mission accomplishment for the company or battalion. Can infiltrate enemy positions to set the conditions for success. May be used to overwatch an obstacle or to secure it. Can be the assault force or the actual breaching force in a breaching operation. Utilize its various weapon systems to destroy or disable a wide variety of enemy vehicles. We addressed these above. Vehicles are maintenance intensive. This not only includes maintenance to repair vehicles, but preventative maintenance to stop potential problems. Vehicles require fuel. Some such as the BFV require more than others. You can’t leave fuel solely to the logisticians to figure out. Commanders must know enough so they can determine what is possible. If a Commander has tanks with his carriers then the issues are multiplied significantly. Some carriers are of considerable size which obviously affects their ability to maneuver in difficult terrain. The BFV in particular cannot be considered a very stealthy vehicle. You are not going to sneak up on an enemy in the middle of the night. This noise signature must be discussed in planning and executing a mission. In most cases, while the carrier is maneuvering; the Infantry Soldiers are buttoned up inside. Not good for situational awareness and not good for those who may be a bit claustrophobic! Infantry Carriers are certainly susceptible to anti-armor weapons. The impact is far greater if Infantry Soldiers are inside the vehicle. The Mechanized Infantry Platoon is a robust fighting unit comprised of 40 Infantrymen when fully manned. Within the platoon, there are two distinctive elements – the mounted element and the dismounted element. The beauty of the platoon is that the elements can fight separately or in combination. This flexibility is a tremendous asset, but one that must be utilized properly. In other words, they must capitalize on the strengths of each other and mitigate the weaknesses of each. Below we will dissect each of the elements. 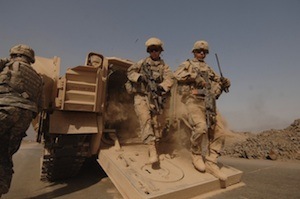 Mounted Element – The Mechanized Platoon is comprised of four Bradleys. These four vehicles are divided into two sections of two Bradleys each. The platoon itself will normally maneuver as a platoon as part of a company. However, there are instances where the platoon may maneuver independently. Within the sections, the Bradleys will operate on the wingman concept. We will dissect the maneuver of the mounted element – both formations and techniques in our next article. Let’s get into a little more detail into the manning of the crew and then each section. The crew of a Bradley normally consists of three Infantrymen. These are the driver, the gunner, and the Bradley Commander (BC). In the instance of the platoon leader’s vehicle, there are four. This is in case the Platoon Leader dismounts the vehicle to maneuver with the dismounted element. This allows the Bradley to continue to be crewed by 3 Infantrymen. Let’s highlight the duties of each of the crew members. As the name suggests, is responsible for everything that relates to the vehicle. As the name suggests, is responsible for everything that relates to his crew. Assists the gunner and the driver in acquiring targets. Issues fire commands to the gunner to engage targets. Ensures the vehicle is in the correct location in formations and maneuver techniques. Oversees all maintenance of the vehicle (hull, turret, weapon systems, etc…). Provides Platoon Leader with situational updates as warranted. Provides Platoon Leader with recommendations if necessary. Continually scans the battlefield searching for targets or threats. If directed by the BC engages targets. This happens several ways. First, the BC may detect the target, provides the gunner the location, and then provides the fire command to the gunner to engage. Second, if the gunner detects the target; he will ask the BC for permission to engage. If the BC departs the vehicle for any reason; will take over the BC duties. Performs unit-level maintenance on the turret and the weapon systems. Must be an expert on the turret and the weapon systems. Assists the BC in a wide variety of duties. This could include navigation and communications operations. Should be an accomplished driver of the Bradley. This allows him to drive the vehicle when the driver may need a break during long marches that have little chance of enemy contact. Will normally be one of younger Infantrymen in the platoon. It is beneficial when he has some experience with the dismounted element. Two key things to remember. First, not all Infantrymen want to be a driver. Second, not all Infantrymen can be good drivers. Obviously, the driver operates the Bradley. He will receive much guidance from his BC as to where to go, stop, start, etc… The more experience the two have together; the less guidance the driver will require. He will understand what the BC wants. A good driver understands how to utilize the terrain and how to drive in different types of terrain. Experienced drivers can detect targets for the BC. Experienced drivers will observe rounds fired down range to determine accuracy. Must be dedicated to preventative maintenance on the Bradley’s hull. A good driver should be handy with the wrench so he can make some on the spot fixes. A good driver knows his Bradley. He knows the sounds it makes and how it runs. He should know immediately when something is not right. There is one unique crew member who resides on the Platoon Leader’s Bradley. This position is called the alternate gunner or loader. When the Platoon Leader is in the vehicle; this Soldier is located in the back of the vehicle. In this location, his principle duty is handling ammunition and assisting the crew in reloading weapon systems that are out of ammunition. This may include any of three major systems – the Bushmaster, the TOW, or the COAX Machine Gun. A good loader saves incredible time for the crew when time is of the essence. When the Platoon Leader is out of the vehicle (normally when he is with the dismounted element on the ground), this Soldier will assume the role of the gunner. This is because the normal gunner becomes the Bradley Gunner with the Platoon Leader now on the ground. The platoon expert on the Bradley. Must know each of the weapons systems intimately. Just as importantly, must be able to communicate his knowledge to his platoon members. The platoon expert on Bradley crew operations. Must be able to assist the other Bradley crews in improving their teamwork within the Bradley. In combat, advises the platoon leadership on the capabilities of the Bradley and its weapon systems. In the defense, advises leadership on fire control measures and assists in the planning of the engagement area. Assists the platoon leadership in the training of the mounted element. 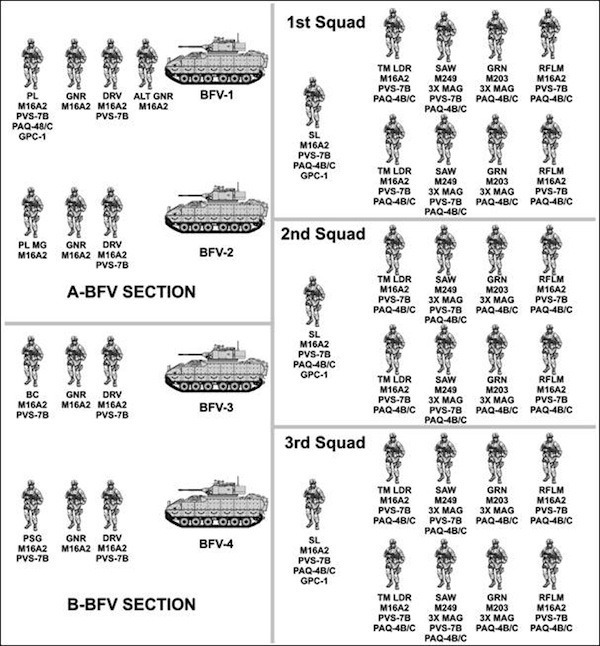 A Bradley Section – Within the platoon, the Bradleys are organized into two sections with two vehicles each. Just as an individual Soldier has a battle buddy; a Bradley has a wingman. This allows the section to work in tandem during maneuver. We will discuss this further in our next article. The two sections within the Bradley are aptly named Section A and Section B. Within Section A you will find the Bradley of the Platoon leader and the Bradley of the Platoon’s Master Gunner. Within Section B you will have the Platoon Sergeant’s Bradley and the remaining Bradley in the Platoon. Dismounted Element – Obviously, the Bradley itself packs tremendous combat power. Now combine that with the dismounted element and you have something special. When fully manned, the Platoon can utilize three nine-man rifle squads or 27 Soldiers. These squads essentially operate just like their brothers in the rifle platoons. Of course, the Bradley and its’ capabilities changes the dynamics in many aspects. Let’s briefly discuss each since we have gone into significant detail during our treatment of the rifle platoon. Squad Leader – There are three rifle squad leaders in the platoon. As always, a leader is responsible for all that occurs or doesn’t happen in the unit he leads. Thus, the squad leader is responsible for those eight Infantrymen and two fire teams which he leads. We will not go over all the duties of the rifle platoon leader. They are essentially the same as the squad leader in the rifle platoon. Obviously, the differences that exist relate to areas tied to the Bradley. Fire Team Leader – Within the platoon, there exist six team leaders (two per squad). Again, his responsibilities basically mirror those of the rifle squad leader. One of the key differences is that a good Team Leader will keep his Soldiers informed as to what is happening when they are riding inside the Bradley. Nothing is worse than dismounting the Bradley and not knowing what you are getting into. Rifleman – The heart and soul of any Infantry organization is the rifleman. This is normally the Infantryman’s first position. Once he learns the ropes and shows his wares; he will move on to other positions in the platoon. This rifleman will also likely carry a powerful M240B machine gun. Anti-Armor Specialist – Each squad possesses an AT Specialist. In our organization that is the Javelin. When taking out enemy armor is imperative on the ground, he will be called upon. We addressed this highly lethal system in our treatment of the rifle platoon and company. Grenadier – Each fire team has a grenadier. He utilizes an M203 weapon system. This is basically an M16 with a 40 mm grenade launcher attached to it. This is a versatile weapon which can fire high explosive rounds when opposing an infantry or light skinned vehicle threat. It can also fire smoke rounds when required and even illumination rounds. It has a range of about 350 meters. Automatic Rifleman – Each fire team possesses an automatic rifleman. The weapon of choice here is the M249 Squad Automatic Weapon or SAW. This system puts out rounds quickly and at a good distance. This is really the weapon you utilize against the enemy’s Infantryman. How do you Organize the Infantrymen Inside the Bradley? So you have these 27 Infantryman and three squads. How do organize them into the four platoon Bradleys? The numbers and the space in the Bradley do not equate to complete squad integrity in a Bradley. Below is a way to make it happen. BFV 2 (Platoon Master Gunner’s Bradley) – The first squad leader is the lead dismounted Infantryman inside the vehicle. He is joined his Alpha Fire Team and half of his Bravo Fire Team. BFV 1 (Platoon Leader’s Bradley) – The lead Infantryman is the Alpha Fire Team Leader for Second Squad. He is joined by his squad and the Fire Team Leader and Automatic Rifleman from Bravo Team/First Squad. Also remember that in the Platoon Leader’s Bradley there is a loader who also rides in the back. BFV 4 (Wingman Bradley) – The second Squad Leader is the lead Infantryman. He has his entire Bravo Team and the grenadier and riflemen from the Alpha Team of Third Squad. BFV 3 (Platoon Sergeant’s Bradley) – The third squad leader has his Bravo Team in entirety and the Team leader and Automatic Riflemen from Alpha Team. Again, this organization is based on a full-up platoon. In reality, there are likely to be shortages and consequently, many adaptations to the above organization. There are two more Infantrymen in the platoon we must discuss – the Platoon Leader and Platoon Sergeant. Obviously, two pretty important Infantrymen within the platoon. Let’s highlight their key responsibilities. Again, the foundation of their duties is no different than their rifle platoon counterparts. We will focus on those duties focused on mechanized infantry. Must understand the capabilities of all his weapon systems. Able to employ weapon systems so they complement one another. Able to successfully maneuver his mounted and dismounted elements. This may be separately, in combination, or just mounted (when Soldiers are inside Bradleys). Serves as the Bradley Commander when mounted. Understands the capabilities of the operating systems tied to mechanized and heavy operations. When all three rifle squads dismount, will normally dismount with them. Operating in terrain which greatly restricts the ability of the Bradley to maneuver. This could be forested areas, rocky terrain, urban terrain, compartmentalized areas etc…. In hilly terrain, you may not want to silhouette the Bradley; but you require better observation or fields of fire. Consequently, you may dismount Infantry to maneuver to these areas. If the platoon is taking highly effective anti-armor fire, it may be necessary to dismount the Bradley. This is if the terrain is conducive to protecting the Infantry. Certainly one of the most common situations is to clear an objective or to assault it. Many times this is planned; at other times it may be an opportunity. In a hasty defense, you will likely dismount Infantrymen so you can make use of their firepower. When an obstacle must be breached. Providing security when the Bradleys will be at the halt for a period of time. We will discuss how the dismounting of the Bradley occurs in a future article. The platoon expert on dismounted operations. The platoon expert on maneuvering the mounted element. Advise and assist the Platoon Leader in integrating the mounted and dismounted elements in combat. If the Platoon Leader is located with the dismounted element; commands and controls the mounted element. If the Platoon Leader is located with the mounted element; commands and controls the dismounted element. Is obviously the Bradley Commander of his own vehicle. The Mechanized Infantry Platoon is a powerful unit. Its’ combination of dismounted Infantry and the Bradley can be highly effective on the battlefield. This is of course if they are used in complement. We will discuss this in far more detail in the upcoming articles. One area we addressed this month which we want to highlight is the situations in which the Platoon Leader may dismount his Infantryman. Again, this is an important decision which is extremely timely. Our next article will continue our dissection of the Bradley Platoon. Our focus will be on the mounted maneuver of the platoon. We will discuss formations, techniques and challenges the platoon faces during maneuver. In 1955 I was in the 25th Armored Inf Battalion, 1st Armored Div the forerunner of The Mechanised Inf. I was the radio repairman for the APC’s & Jeeps & hand held radios. Riding in an APC was heading into the unknown & also dismounting. I would rather be straight infantry. To me they were death traps especially if you were ambushed. I was with the 25th inf 27 regt in Korea 1952-1953.Tommy Quirk. Mechanized infantry is the most misused element in the fighting forces. When properly trained and employed it is a force to reconcile with. When engaging dismounting is a must to fully utilize both the mounted firepower and the dismounted maneuver capabilities. When mounted, the ability to travel cross country, dispersed, provides security and quick travel. Support of tanks and other transports are a critical element. Planning for resupply of fuel, armaments, and rations is critical to the overall plan. Tanks need infantry to provide critical security and infantry needs tanks to provide necessary support. Neither is very capable without the other. Dismounted infantry cannot support a fast moving armored force. A fast moving armored force without infantry will suffer significant losses and will be incapable of resupply. A airmobile infantry force is incapable to provide this support to a armored force and would suffer major losses. Anyone who classifies mechanized infantry as coffin riders spent way too much time riding.